Welcome to the home decor world, where #Shelfies are the new #selfies! If you haven’t stumbled upon this fun hashtag on social media yet, its about time you checked it out. #Shelfies are the home of styled shelves that reflect personality and decor styles perfectly. They can easily be rearranged with changing seasons and moods, just like your wardrobe! As you might expect, the perfect styled shelf is not an easy thing to come by. It requires patience and time to compile an artful collection of items and yet more time to create a new home for them on your shelf. 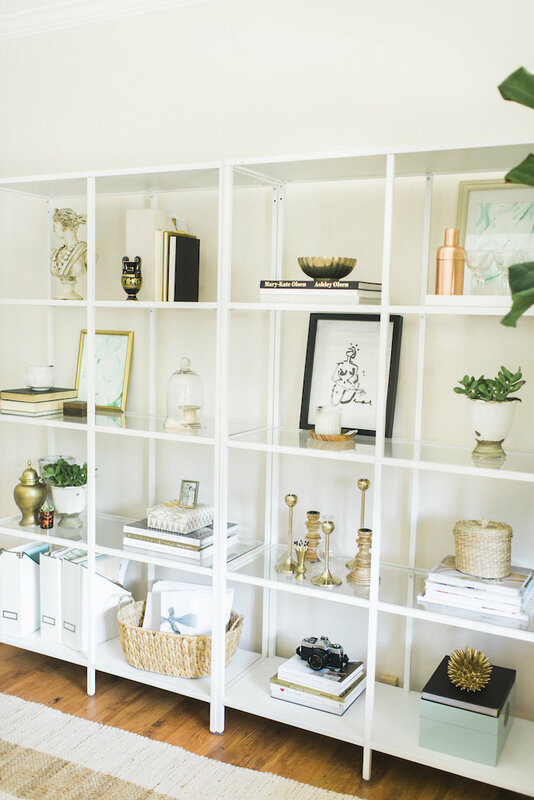 But don’t worry, if you can remember these five simple rules, you can easily up your shelfie game and get that beautifully styled bookshelf every time. 1 | Vary Your Stacks. Any styled shelf should start with books of course! 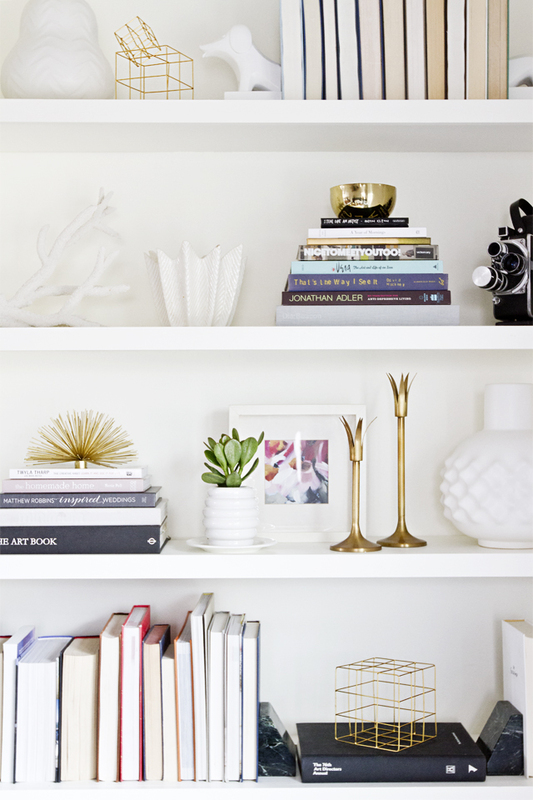 Your collection of books, magazines, or even notebooks should act as the base for styling your shelf. Instead of just lining them up on the shelf, try to vary the way you place them. Place one stack in a normal horizontal row and then contrast that with a vertical stack of books. If your goal is to create a shelf with less variation in color, consider flipping the books so you are viewing the pages instead of the spine, like the above image. This will create a more uniform color scheme all around. 2 | Use the 1:1 and 1:3 Ratios. When styling your shelf you want to remember to place one object for every stack of books placed on the shelf. For shelves that are separated into compartments, treat every compartment as its own entity (like the above image). The objects you choose to mix into your shelves can be anything from candles, pictures, or plants. Use these objects to express your style! If thats a nautical theme try a rope ball, fishing mementos, and sea colored objects. These objects bring t0 life what would be just a typical bookshelf otherwise. For areas without books, use the 1:3 ratio. For example, three magazine files or one large object and three smaller objects, etc. If you really want to use more than three, just try to keep groupings in odd numbers for visual appeal. 3 | Add Color. The next step is to focus on your color choices. This can be bright colors like pink and yellow, muted colors like sea foam green and grey, or any other colors you love. Make sure to give yourself enough colors to play with. My rule of thumb would be at least 2-3 colors. You can also varry the shades of those colors to add even more depth to your shelf. 4 | Add a Something Metallic or Sparkly. Metallic tones like gold, silver, and even the use of mirrors add another dimension to your shelf. Especially when placed near a window or light fixture, these metallic objects pick up the color placed elsewhere on the shelf and reflect it. It provides a sense of three dimensionality for your eyes when placed next to a flat, two dimensional object like the books and other objects. 5| Make it Personal. Mix in pictures of you and your family members to make the shelfie seem more personal and less like a shelf full of merchandise at the store. If you are a collector of items that have a deeper meaning to you, find a way to mix them into your shelf design! Adding in pieces that are specific to you, gives your shelfie character and meaning! So what are you waiting for? 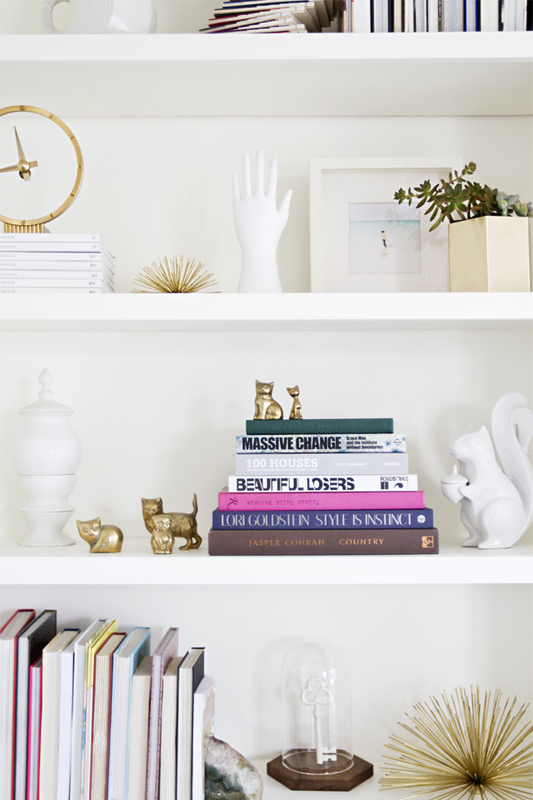 Go get that shelf styled and post your #shelfie today! I’d love to see what you come up with so be sure to share it with us in the comments below. Great advice! I always struggle with styling shelves. 💛 this! I always struggle with decor in general and shelves especially. My mantle currently has 2 things on it, oops! I’m obsessed with shelves but never quite knew the art to styling them. Thanks for such an informative, beautiful post! I’m such a visual person . . . and this is why I love Instagram. I will most likely be spending my evening looking at the shelfie hashtag and will have screenshots of everything I love! But in my defense I move in about 6 months so I’m planning ahead LOL! Trust me, you will not regret it! The hashtag is filled with such great inspiration. Hey! Where did you get those gold kitty figurines!? Soooo cute!